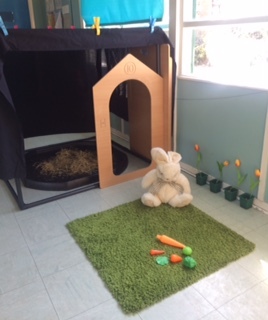 In preparation for our visit from the Easter Bunny, we have been learning all about rabbits. 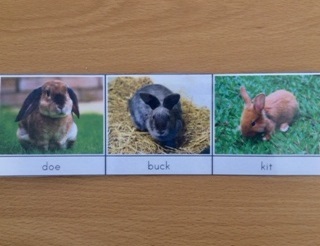 The children learnt about the parts of a rabbit, then matched pairing cards and labels. The children developed their sense of sound matching the sound cylinders. Their sense of touch, pairing 3D solids blindfolded with the stereognostic bag and sight, grading colours with colour box 3. We learnt that wild rabbits live in burrows and domestic (pet) rabbits live in hutches. The children then developed their problem solving and team work skills, making their own 'hutch' for our home corner. 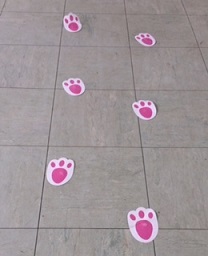 We learnt rabbits can jump as high as 4 ft and up to 15 ft horizontally! The children then put their jumping skills to the test. They marked their jumps against a 15 ft measuring tape and recorded their jump distance. 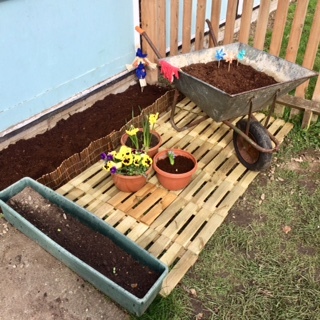 We also added the final touches to our new flower bed. The children will tend to the seedlings and flowers, observing growth and change. After waiting with bated breath, the Easter Bunny finally came to visit! 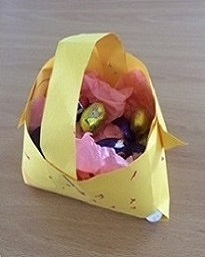 The children had lots of fun making Easter baskets, taking part in our egg hunt and making nest cakes. Have a wonderful Easter and we look forward to seeing you all for another eggsciting term!